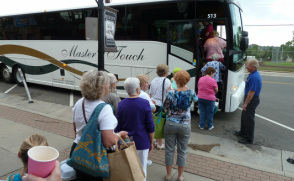 forging lasting friendships with our quilter members. 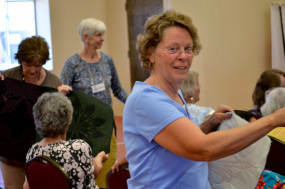 Our educational programs cover a variety of quilting topics for diverse skill levels and often include a workshop. 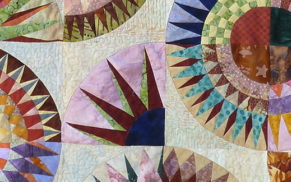 Every two years, Chino Valley Quilters hosts a Quilt Show for quilting enthusiasts, educators and members of the quilting-supply industry. Funds raised from the show support our ongoing work in the community. Blocks and challenges are a small but important part of our regular guild activities. Blocks are the backbone of our Comfort Quilts and other community programs. Chairman's Challenge Quilts are small projects designed to challenge our creativity through a group competition done in the spirit of fun. Show & Tell is a fun and popular part of our monthly meetings. It's about creativity and inspiration, not critique. (Though some members ask for criticism and advice afterwards.) 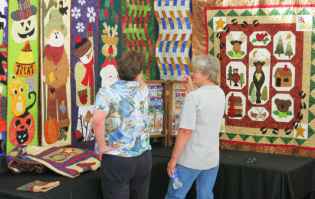 Show & Tell allows us a special time to show our latest quilts or quilting projects. We get to tell a little about how we made them and why. Show & Tell is another way members inspire and challenge each other. 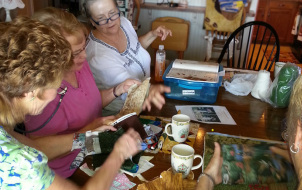 Friendship Groups are a way of invoking the spirit of the small-town quilting circle that formed our guild. Though our group is small, Friendship Groups usually have no more than 15 members, letting us get to know each other better and enjoy time spent on shared interests. Most groups meet monthly in addition to the regular meeting and organize additional special events, such as sew-ins, shop hops and potlucks. 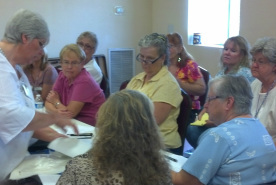 We've been busy quilting in Chino Valley. Now, let's get out of town and have an adventure!